Word Reader .NET is an advanced component that helps developers to read Word documents ( DOC , DOCX , RTF) in .NET applications in a simple and efficient way. It supports C#, VB.NET, ASP.NET. Using Word Reader .NET, developers can easily open and read the Word document. 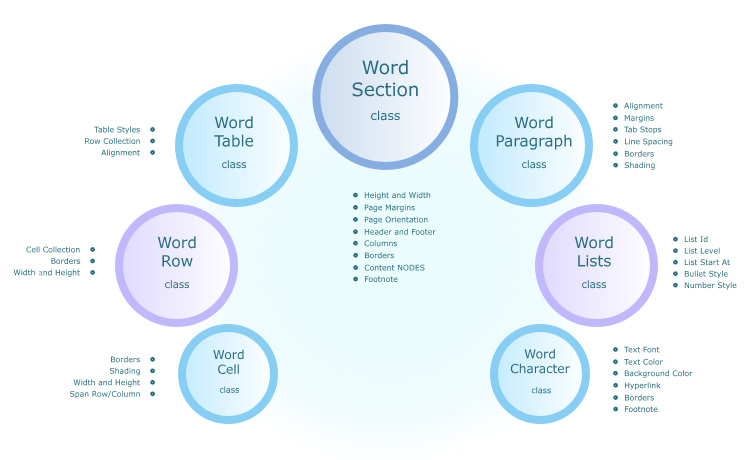 The component is based on our intuitive Document Object Model that consists of over 100 classes. The set of functions allows developer to read DOC, DOCX, RTF deeply into the word document up to the text character and its styles, fonts, colors, borders etc. Alignment, Margins, Line Spacing, Shadings, Tab Stops etc. Background color, Hyperlink, Footnote, Borders etc. Width, Height, Borders, Shading, Span Rows/Columns etc. Word Reader .NET doesn't require installed Microsoft Word. Requires a license for Microsoft Word on every client machine. Word Reader is a standalone .NET component taking 0.5 MB. MS Word is loaded in the background, loading a large number of components and taking a time. 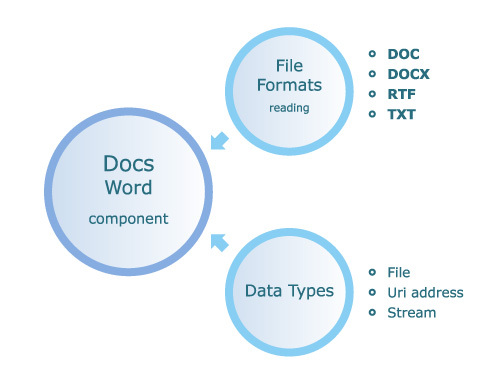 Word Reader .NET is designed for processing large number of DOC, DOCX and TXT files. Microsoft Word was designed as UI application and because of that API is very slow. Files generated with Word Reader .NET are compatible with Word 97, Word 2000, Word XP, Word 2003, Word 2007, Word 2010 and OpenOffice. Requires that all client machines have the same version of Microsoft Word installed. Word Reader is a pure .NET component. Microsoft Word API is a COM library with bad integration with .NET Framework. Word Reader .NET component requires only .NET Framework. It is many times faster than MS Word Automation objects. The code of Word Reader .NET component is fully managed. Compatible with C# / VB.NET applications and website projects. Does not require installed Microsoft Word (Comparison table).